From Amazon’s “Last Mile” strategy to offer free delivery of groceries from Whole Foods within just two hours of placing an order, to Kroger Edge, which communicates with shoppers’ smartphones and highlights their digital shopping lists as they walk down store aisles, there’s no denying that today’s consumer is hungry for a seamless shopping experience across multiple channels – online, mobile and in-store. 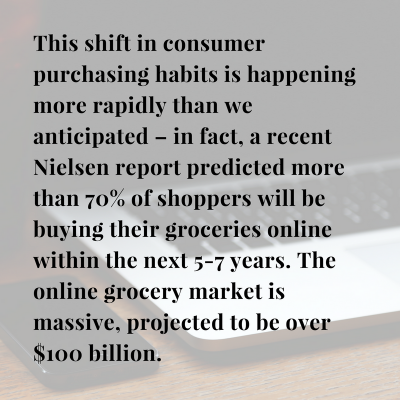 This shift in consumer purchasing habits is happening more rapidly than we anticipated – in fact, a recent Nielsen report predicted more than 70% of shoppers will be buying their groceries online within the next 5-7 years. The online grocery market is massive, projected to be over $100 billion. The effects of this fundamental shift in consumer habits go beyond retail. In the race to establish a presence across multiple channels, food manufacturers are faced with unexpected challenges, especially when it comes to maintaining brand equity. Based on our work with top U.S. companies, we’ve identified key challenges that food processors and marketers should address in their omnichannel strategy. Brand consistency is often compromised. The proliferation of online shopping has paved the way for thousands of vendors to offer a limitless range of products online, which makes it that much more challenging for companies to control consistent messaging and brand presentation across multiple channels and online marketplaces. Every brand that sells on multiple channels runs the risk of having outdated product, packaging and content shown online. In some listings, we’ve seen product packaging that is three versions old! The inconsistent and subpar product presentation online damages your brand’s equity, deters repurchases and burdens your retail partners with customer service issues. How can brands strive for consistent and high-quality presentation across physical and digital channels? First, make sure that your brand content, product and packaging images are all up-to-date in the product information databases, including SPINS, Mintel, etc. This seems like a simple step, but many brands neglect this task when there’s a packaging or branding update. Invest in technology and automated systems that monitor product placements across multiple retailers and channels. Last, pursue exclusive partnerships with online market places like Amazon to prevent unauthorized wholesalers from listing your products. Partnering with a sales and marketing agency with omnichannel expertise will not only guide the selection of the right retailers and channels for your brands, but also, optimize your product listings, discoverability and sales conversion across physical and digital stores. A segregated approach to e-commerce puts your brand in a vulnerable position. As online and mobile commerce rapidly expands, many companies have established teams or divisions to exclusively address e-commerce. Unfortunately, these teams tend to work in silos, segregated from the enterprise sales and marketing functions. The majority of our CPG clients have not yet augmented enterprise sales plans with e-commerce strategies. Yet, 73% of shoppers are omnichannel, per an extensive Harvard Business Review study (reported 1/3/2017). Retailers are transforming their services to satisfy consumers’ cross-channel behavior, including: order online and pickup in store; showrooming; webrooming; use of digital tools such as interactive catalog, price check in store. For brand owners and food manufacturers, it is imperative to integrate e-commerce strategies into the overarching growth plan, as well as manage e-commerce and “traditional” teams with coordinated sales process and shared goals. If you’re not currently managing the e-commerce effort in-house, seek a sales and marketing partner with omnichannel expertise to efficiently fast-track your ecommerce strategy and programs. Taking the single-channel route leads to missed opportunities. Omnichannel selling is multi-faceted – offline and online, as well as multiple online marketplaces including Amazon, eBay, Facebook, Google. Each channel provides different opportunities in product listings, discoverability, merchandising, promotions and sales conversion. Online marketplaces, such as Amazon, constantly evolve their selling platform, search and list ranking algorithms and marketing services. While CPG companies manage placement and marketing in brick-and-mortar retail very well, most lack the knowledge and skilled resources to tackle the dynamic omnichannel space. This results in lost revenue, margin and customer loyalty, due to poor presentation, pricing and promotions online. CPG companies will benefit from partnering with a sales and marketing agency steeped in the omnichannel space and vigilant in seizing the right opportunities to grow sales. Effectively competing in the omnichannel marketplace is essential to sales and market share growth of food companies. Brand equity is much more difficult to control across multiple channels. Partnering with the right expert support system, integrating traditional and e-commerce retail strategies, and investing in the right tools and cross-channel analytics are critical to win in this dynamic and massive space.